The Downtown Boca Friday Night LIVE! monthly entertainment series presented by JM Lexus on Friday, July 6th continues independence week celebration with a free, open-to-the-public family fun evening of “Panthers Play, Patriotic Picnic, and a “Miracle” Americana-style in Sanborn Square beginning at 6:30 p.m. 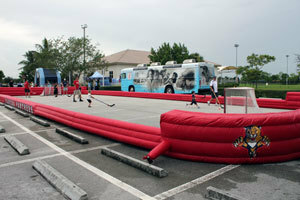 Programming features the NHL’s Florida Panthers “Panthers Patrol” hosting a variety of interactive activities for children including an 88-foot hockey rink and an obstacle course, local award-winning soloist Kendra Fulmer taking the stage with family sing-along patriotic anthems and family film “Miracle” starring Kurt Russell taking the screen as dusk sets in sharing the remarkable true story of the 1980 U.S. Olympic hockey team victory over the seemingly invincible Russian squad. The ever-popular Gourmet Truck Expo will be street-side throughout the evening serving up easy-to-grab American picnic favorites, including American barbeque hamburgers, hot dogs and more. 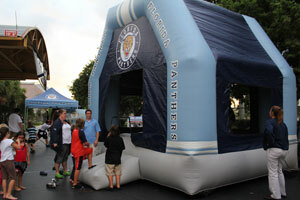 The Panthers Patrol will lead the fun beginning at 6:30 p.m., bringing its interactive fan-favorite activities all the way from the BankAtlantic Center to give children an experience they are sure to remember. 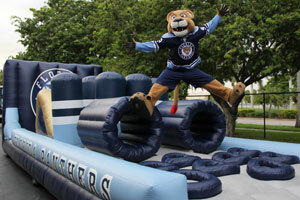 Youngsters can test their agility and speed on the unique Panthers Obstacle Course and take their own shot at making a goal at the hockey rink, while smaller children can hop around in the always-popular bounce house. 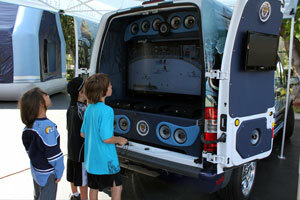 The Panthers Patrol Party Mobile will also be on-site, a “tricked-out” interactive gaming mobile fully equipped with three flat-screen TVs and Playstation 3 gaming systems, where children can move their own favorite Panthers players to victory. Visitors are encouraged to “come early, stay late…where something for everyone awaits” as thousands have done for previous Friday Night LIVE! events that included Chris MacDonald, the “ultimate Elvis tribute artist”; Tito Puente, Jr. and his Latin Jazz ensemble; and CityLink’s Boca Beerfest. The Friday Night LIVE! evenings include gourmet truck dining with café seating, extended hours at participating businesses with special sidewalk tastings, samplings, trunk shows, dining specials, menu items and discounts and often late night “after parties” for exploring and enjoying the destination, from Mizner Park to Royal Palm Place, including the signature collection of shops and boutiques, restaurants and galleries along Palmetto Park Road and Plaza Real South. “Downtown Boca’s July Friday Night LIVE! ‘picnic in the park’ evening is the ideal way for families to bring out the picnic blanket and continue to celebrate independence week, embrace the excitement that summer brings and explore and enjoy Downtown Boca with family and friends,” said Boca Raton Downtown Manager Ruby Childers. She added that the Friday Night LIVE! event presented by JM Lexus in August is themed “CountryTown”. Free parking for the event is available at City Hall (201 West Palmetto Park Road), the Boca Raton Historical Society (71 North Federal Highway), the Downtown Library (200 Northwest Boca Raton Boulevard) and other locations downtown where event signage is featured. Held on the first Friday of every month, the Friday Night LIVE! series presented by JM Lexus fills parts of Downtown Boca (including Sanborn Square and Palmetto Park Road), showcasing live themed entertainment by award-winning bands and vocalists as participating shops, restaurants, and clubs extend their hours for “shopping and strolling” and offer Friday Night LIVE! samplings, discounts, and specials. In addition, the Gourmet Truck Expo lines the event streets with themed culinary offerings and café style seating, art galleries plan exhibitions, boutiques may feature sidewalk fashion or trunk shows, and more for exploring and enjoying the destination, from Mizner Park to Royal Palm Place, including the signature collection of shops and boutiques, restaurants and galleries along Palmetto Park Road and Plaza Real South. Visitors are encouraged to bring their own blankets and chairs; chairs available for rental at $2. 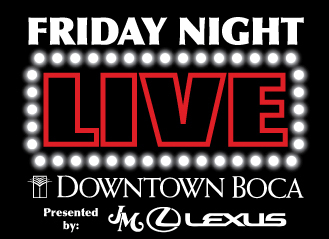 Downtown Boca has teamed up with the Boca Raton Bridge Hotel to provide a special discounted room rate for each event night of the Friday Night LIVE! series. To take advantage of this offer, call (866) 909-2622 for reservations and book a room with the promo code “DTBF”. *themes subject to change. Most series events are free. For more information and event details, visit DowntownBoca.Org regularly. To become a Downtown Boca event sponsor, contact Jon Kaye, Kaye Communications at jkaye@kcompr.com or 561-392-5166.